While walking around Disneyland park the other day, a colleague pointed something out that I had never noticed before in the queue for Indiana Jones Adventure. This got me thinking … what else could someone miss while exploring Adventureland? 2. A photograph of Tarzan’s parents in Tarzan’s Treehouse – It’s a little challenging to find, but once you cross the bridge onto the Disneydendron semperflorens grandis (“large ever-blooming Disney tree”), you’ll find a small hut that has been ransacked by the villainous Sabor. On the floor, you’ll find an old photograph of the young family. The palm tree right next to the entrance to the Jungle Cruise – believe it or not – dates all the way back to 1896! 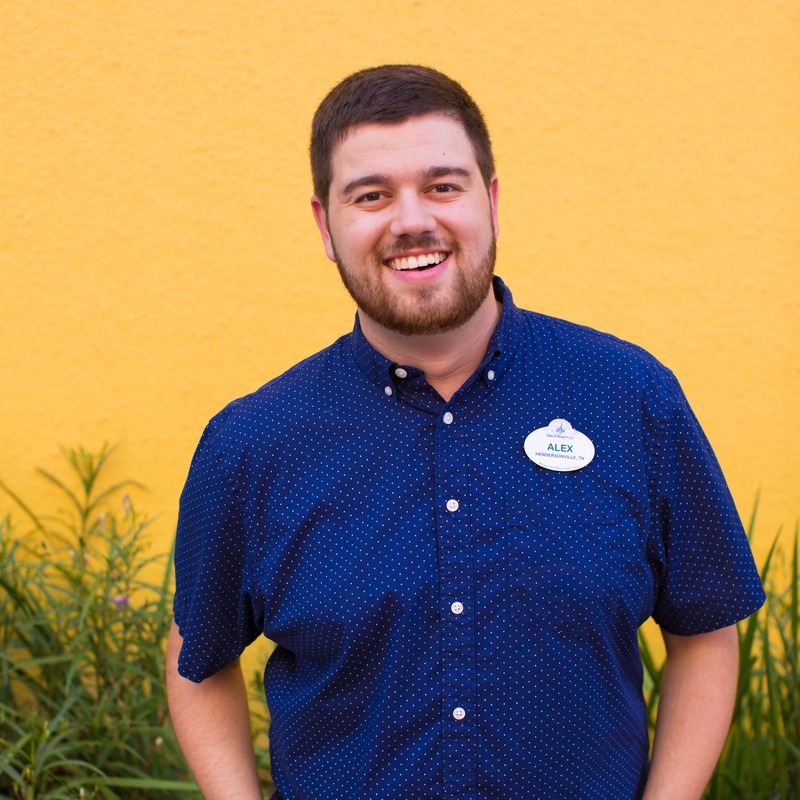 When Walt Disney bought the property that would become Disneyland, he promised the owner that he would not remove the tree because of its sentimental value to the family. 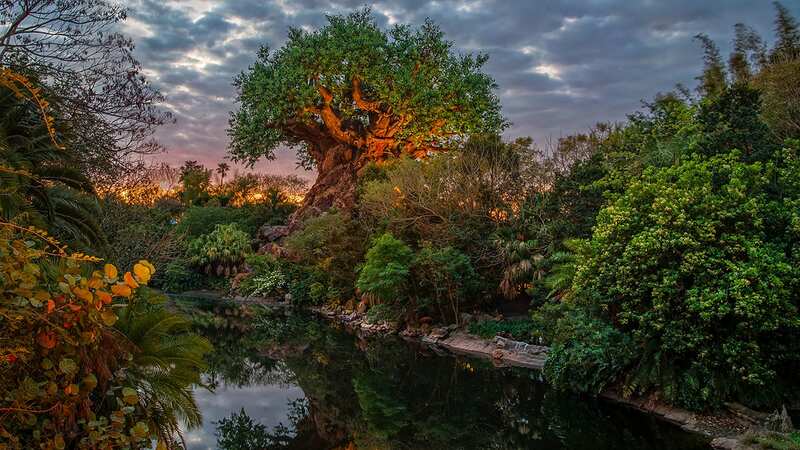 Disney Legend Bill Evans, who guided the landscape design of many Disney Parks, moved the tree to the Jungle Cruise entrance, where it proudly stands today. 4. Eeyore Parking Lot Sign in Indiana Jones Adventure Queue – Once you enter the Temple of the Forbidden Eye and reach the Projection Room, turn behind you and look up. Next to the projector, you’ll be able to faintly see a sign from the now-defunct Eeyore parking lot. The space that is now Indiana Jones Adventure was once home to the Eeyore parking section of the Disneyland parking lot! 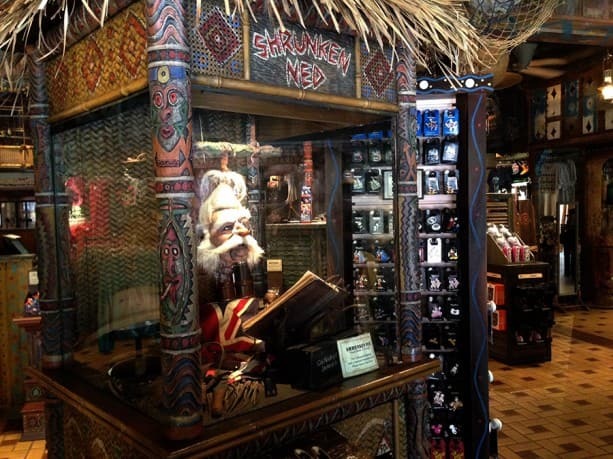 Located in the center of the marketplace, South Sea Traders is home to one of my favorite people in all of Disneyland park, Shrunken Ned. Housed inside a bamboo kiosk, Shrunken Ned is the magically shrunken head of a 19th century British explorer, who – for a small fee – will diagnose any illness and provide a small souvenir! What is your favorite hidden detail in Adventureland at Disneyland park? Let us know in the comments below! Donna…the Mickey ears are on a skeleton on the left hand side of the vehicle at towards the beginning of the ride before you go over the bridge. There’s a few skeletons hanging and it’s on one of them. Thanks Deborah and Adam! I have never been able to see the Eeyore sign either and can’t wait to find it. 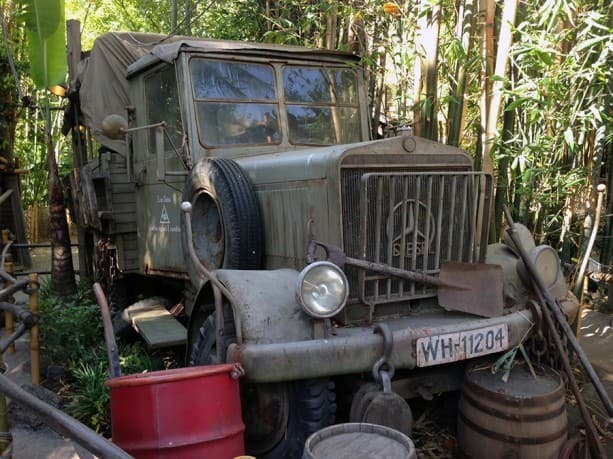 Here’s a QUESTION: Does anyone know where the hidden Mickey Ears are located inside the Indiana Jones ride? We have heard about them for years and wonder if they are actually there or if this is a Hidden Mickey legend! Tyler I dont know if you noticed the one of a kind Indy Troop Transporter is still wearing it’s original tires from the film called “Indra”. How about the old phonograph playing the Swiss Family Robinson Polka in Tarzan’s camp? Yes, if you ask the cast member in the projection room, he/she will shine a flashlight and the Eeyore sign will be so much easier to see! My wife and I had our first date opening night of Fantasmic and we parked under a Eeyore sign where indy is now. May not be the one in the Indy q but it was one. My favorite is Mrs. Potts in Tarzan’s camp! Sometimes it’s easier if there isn’t much of a line, to ask the helpful Indiana Jones employee to shine their flashlight on it. It is tricky to see the first time but once you see it, it is easier to find without the flashlight. I also like to pull on the bamboo stick and the rope to the well in the line queue for Indiana Jones. You have to pull hard and quick with the bamboo, but it surprises and delights first timers in the line. Shrunken Ned looks very similar to explorer and collector Lord Henry Mystic from Mystic Manor in Hong Kong Disneyland! Are they related?! Amy, you have to be up at the very front of the line, near the movie screen. Look back and up at the projector. You can’t see it with out shining a light on it. I have had luck taking pictures of the darkness with my flash on, and then seeing the sign in the pictures. I look for the Eeyore sign every time but haven’t found it yet! Thank you for this fun and informative post today, I really enjoyed it. I love how Disney Imagineers take great care to focus on details that many people would overlook. I think it fosters a sense of pride in one’s work and has definitely taught me to step back and be more patient with projects. The Dominguez tree is the kind of Disneyland secret I love to read about. 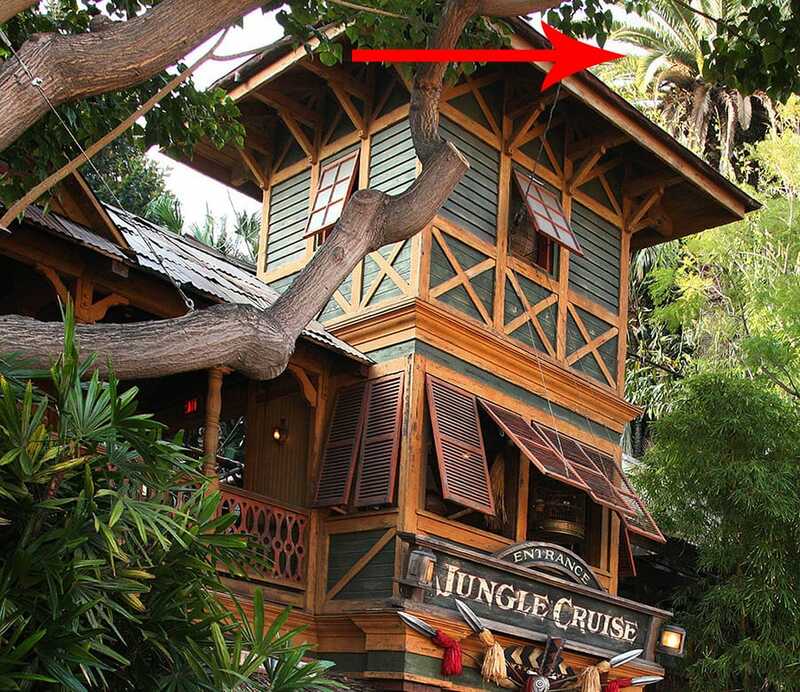 You can find it near the doorway to the Indiana Jones Fastpass building (sort of behind some bamboo), and I think it’s really sweet that even after all these years, the Imagineers made sure to cut a piece out of the roof so that it didn’t damage the tree. I meet with Shrunken Ned during every visit to Disneyland. Such sage advice for only 50 cents! and don’t forget about Aladdin’s Other Lamp just a few short steps away! If you know where to look, there’s a sprig of leaves from the Swiss Family Robinson Treehouse on the Tarzan’s Treehouse tree. I haven’t noticed that before, Donald! I’ll have to take a look next time!